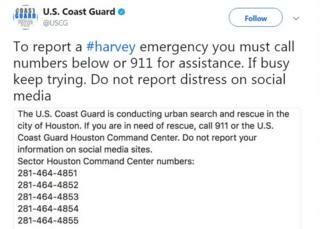 The US Coast Guard is asking people not to seek help via social media if they need assistance during Storm Harvey. It is urging them to "keep trying" the emergency phone numbers instead, although some have pointed out that mobile phone batteries are running low. One expert said it could be because social media posts can be hard to verify. Many people are tweeting their addresses and asking to be rescued. However it is possible that not all the requests will be spotted - and they may not all be genuine. "The web is messy and unpredictable," said Euan Semple, who advises on the impact of social media on businesses and society. "You have to be able to judge signal from noise." Mr Semple added that persuading people to follow the Coast Guard's advice would be challenging. "If you're in an extreme situation, and you can't get access through formal channels, and there is the prospect of help from somewhere else helping your signal to be seen, it would be tough not to." Residents of a care home were rescued after an image of them waist-deep in floodwater went viral on Twitter. Facebook has activated its safety check-in in Texas so that affected members can mark themselves safe.